THE PARTISAN DEBATE INTENSIFIES ON OUR STRATEGY IN IRAQ, SYRIA, AND BEYOND – NO SIMPLE ANSWER! 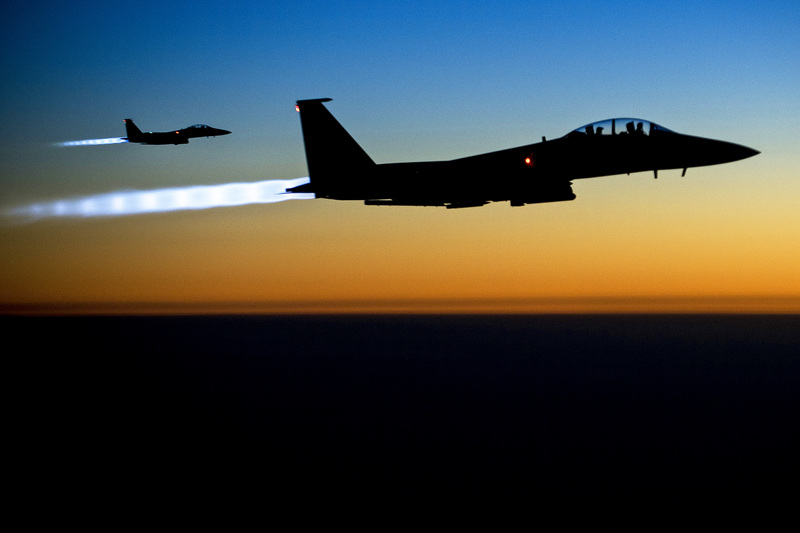 F-15E Strike Eagles flying over Iraq after bombing ISIS targets in Syria. President Obama has spoken at the United Nations General Assembly and gave an excellent summary of the global challenges that we currently face. He had earlier made a number of short and general statements about his perspective on the U.S. and the international coalition that he has assembled, but now comes the hard part of implementation and fixing the train wreck caused by Bush II’s invasion of Iraq. Recently, a surge of criticism has focused on President Obama over whether he and the intelligence community misjudged the spread and effectiveness of ISIS forces. This has been used by right wing Republicans, notably Rep. Mike Rogers (R-Michigan), Chairman of the House Intelligence Committee, to beat up on Obama: “This was not an intelligence failure, but a failure by policy makers to confront the threat.” This is despite the fact that they too were getting about the same briefings from the CIA on the Syria and Iraq security situation all along. Even the New York Times has played the story on the September 30th front page by Peter Baker and Eric Schmitt, the way the GOP hardliners want to see it played. The White House reiterated that the President took full responsibility, but the fact is that nearly everyone, our intelligence, our diplomats, and the media, did not see in advance the capability and power of ISIS, nor the astonishing weakness of Iraqi forces which collapsed under poor, indeed corrupt and incompetent leadership and a sectarian myopic government. There are many serious skeptics on both sides of this issue. Some think Mr. Obama is doing too little, while others believe he is doing too much. The right and left isolationists want to do nothing. Others’ first reaction is to go all in with a military strategy and send in our combat troops. Fortunately, neither extreme has won their case yet. We seem to have a policy that is circumscribed, yet with the limit of no combat U.S. troops on the ground, and is open to the necessities of a conflict, that while defined, is also faced with a difficult, perhaps impossible goal of degrading and ultimately destroying ISIS. I am and have always been skeptical of any absolutist ideas to fix any global issues. We must avoid simpleminded approaches and knee-jerk reactions to complex and high risk problems. Events arise that we cannot foresee in the world of un-predictable kinetic war, muddy civil strife, and centuries long hatreds. Those who argue they have an easy solution are fools, especially those who think sending in more and more US troops will somehow be the silver bullet that is necessary. At bottom is the question of whether America should or should not be engaged in the problems and challenges of our frail and high risk globe. That is one key question that is still being debated since our Revolution and through the terrible costs of two world wars and the many conflicts of the last two centuries. The other key question which follows if one believes that America cannot stand aside as the world is embroiled in problems, and especially as the world’s “super power,” is just when and where to apply our power and resources. People often point correctly to all the stupid and unnecessary harm we have done over the decades. That clearly includes Vietnam and the Bush II war in Iraq. On the other side one cannot, in my view, dismiss the good we did, especially after the Second World War, in creating a global landscape quite different from our withdraw from the world after the World War One. The proof is the peaceful space we helped foster with the Marshall Plan, the creation of the United Nations, the creation of new international financial institutions, NATO, and the expansion of global trade and aid to our poorest nations with institutions like UNDP, UNICEF, the World Health Organization, and our own USAID. What lessons can we learn from these earlier acts? Or are we perhaps learning the wrong lessons from our past history? Or simply, are we coming to the wrong conclusions about events that are not the same as the ones we face today? Another question is the basis for the choices of our actions. If one believes, as I do, that we do have a larger responsibility as part of a common humanity to make our world safer and fairer, how do we do so in a responsible and effective way? The international community has decided that the “responsibility to protect” is an agreed upon consensus among nations. Yet because of the veto in the Security Council it has frankly not been fully operable. Some mechanism thus needs to be found to institutionalize this concept into some kind of reality. Within the construct of the need for action against ISIS, we need to think deeply about the risks and efficacy of our options. We need to acknowledge we can’t do everything and can’t act everywhere at the same time. The world has shown that it does not exist within our “construct” and is far more complex and unknowable. We today are facing many major crises that can have an impact on the entire globe and hundreds of millions of people. There is also the question of acting either cooperatively with others or “going it alone.” Some say we should act alone as needed and we have done that from time to time. We have also fought wars and created new global efforts and institutions in a multilateral context: the UN, NATO, OECD, G-7 and G-20, World Bank, and various “coalitions of the willing.” Frankly, some have been failures, while others have been successes. Neither is an excuse for inaction and indifference to a world of turmoil. It is the need to ask hard questions and demand for even harder answers in order to find the “best” possible options to be decided and implemented. We need to move away from believing that “easy” simplistic answers are enough. To get to this stage as a “great power” we need to move away from the corrosiveness of our politics, the extremism of many of our Congress members, and the “crazy” media with hate, greed, ignorance, and bigotry their motivation. More on those “hard” questions in another post. Previous Article COALITION AIR STRIKES OVER SYRIA AND IRAQ – WHERE NOW? Next Article AFGHANISTAN ALL OVER AGAIN: BEWARE OF PAST MISTAKES! You make good points about sometimes our actions do more harm than good. Obama’s trying caution before jumping in is a good thing. But the reality not acting is not always the right thing and each crisis or challenge needs to be judged on the basis of the reality on the ground and our values and interests, and ability to see a better outcome by our actions. Each case you cite had a different landscape and problems that was unique to each. I do not share your view on the Ukraine as the fighting (and the killing) was started when Russia invaded Crimea with its solders, special forces and controlled local mercenaries. Then the Russians and/or Russian controlled separatists killed hundreds of innocent passengers on a Dutch plane, and then sent in more solders into East Ukraine an independent state and kill more people. This started a conflict which both sides sadly killed people. But the Ukraine has the right to defend itself against an invasion. But it was the Russians that initially committed a violation of international law by making war on a country that did it no harm and for which in the 1990s it promised to respect. And by the way our officials urged the Ukraine government to avoid killing civilians, sadly in a civil or other war this too often happens. But the responsibility rests on Putin not Ukraine for the results. Yes, I am a supporter of the UN “responsibility to protect” and overall I think when there is mass slaughter of civilians the international community can and indeed should, when feasible, act to prevent the killing. Too often in the past we have indeed look the other way (Rwanda comes to mind), and mistakes can be made, and the landscape in the Middle East is a bit messy, as we professional strategic types use the technical term. I am appalled by the action of Israel in Gaza, and you may know that the US tried time and time again to broker a stopping of the conflict and condemned the killing on both sides of civilians. But given your basic views on keeping out of fights I assume that you would not have sent in US troops in this case. Perhaps this was a case where international peacekeepers might have helped if both sides could agree? We do not need to take military action. Every military action we have taken since 2001 has made things worse not better. We need to stop supporting, funding, arming, and training Syrian rebels and to pressure our “allies” to do the same. We need to give up on the fantasy of the “moderate” Syrian rebels. They are all incompetent who lose their weapons to SIS/ISIL or other radical groups or Islamists who go on to join ISIS/ISIL or other radical groups. We also need to stop pretending that we honor the responsibility to protect. Instead, we use it as an excuse for military intervention when we want to overthrow a regime and we ignore it when violence is being done by a regime we support. We cite responsibility to protect in Libya in 2011, in Syria in 2013, and in Iraq and Syria in 2014. We ignore it when Ukraine is shelling civilians in breakaway areas in 2014, whenever Israel attacks Gaza killing mostly civilians, and when Iraq shells and bombs civilians in its cities in 2013 and 2014.